It’s hump day! And what better way to celebrate than with a healthy and quick meal to get you over the Wednesday Blues. 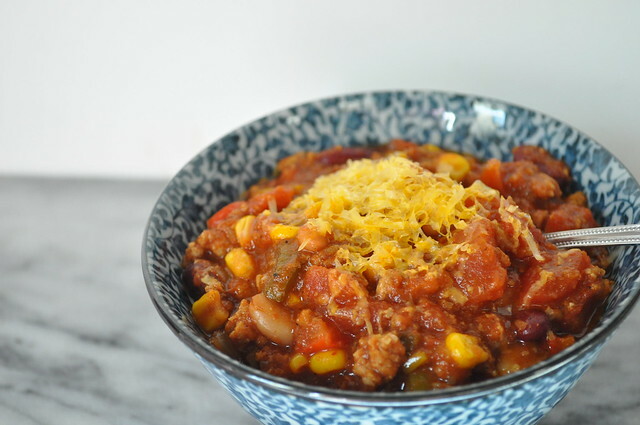 This meal is super simple, and super delicious. 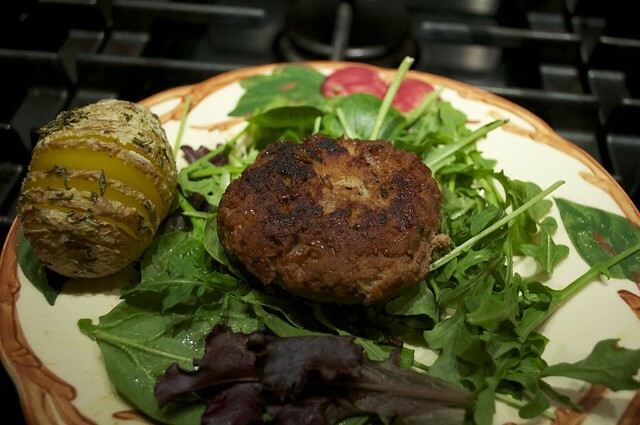 It’s also packed full of flavor, protein, and all the good stuff to keep you full and satiated. 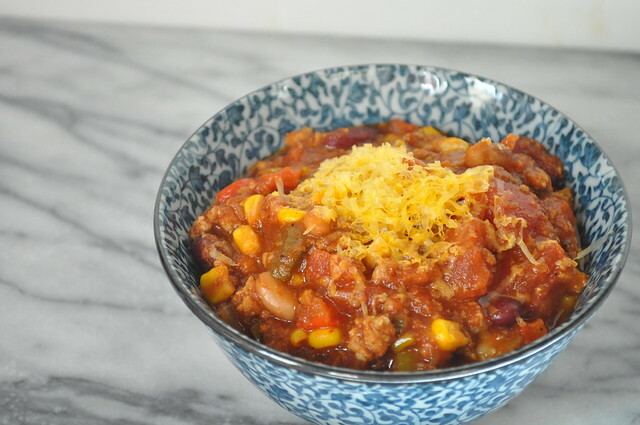 And Chili is always better the next day, so this is the perfect meal that can be stretched over a few days! It may seem like a lot of work, especially given the amount of ingredients, but most of the prep and work comes from chopping. So don’t be scared! And if you’re really that lazy, you can always buy most of the ingredients already chopped! But for us, personally, chopping is very therapeutic. In a large Dutch oven or cast iron pot, heat two tablespoon of olive oil. When the oil is good and hot, throw in your diced onion and cook for two minutes. If needed, add another tablespoon of olive oil and add your turkey. Season liberally with kosher salt and pepper. This is the only time to season the meat, don’t be afraid. Especially with turkey. We like to add a little of sprinkle of cinnamon to the meat while it browns. It adds a real nice depth of flavor. Next, add the beer and a couple splashes of worchestire and allow the meat to cook in the beer. Cook until the majority of the liquid has cooked off. Add the bell peppers, jalapenos, and green onions. Mix and cook for a minute. 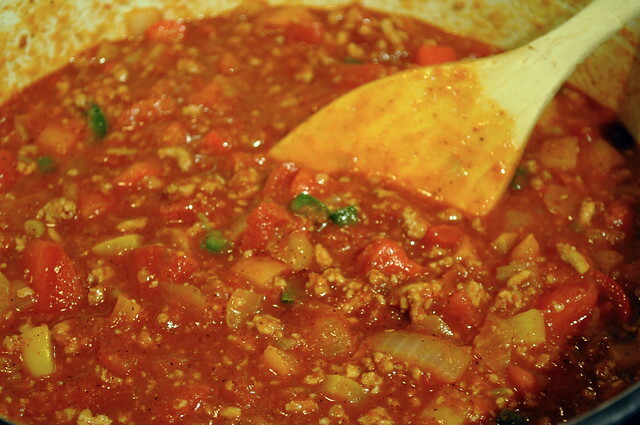 Add the tomatoes, green chilies, beans and assorted seasonings. Stir and bring to a boil. Then lower and cook for at least two hours. Add the frozen corn and allow to warm for 3 to 5 minutes. At this point, taste and adjust the seasoning by adding salt and pepper. 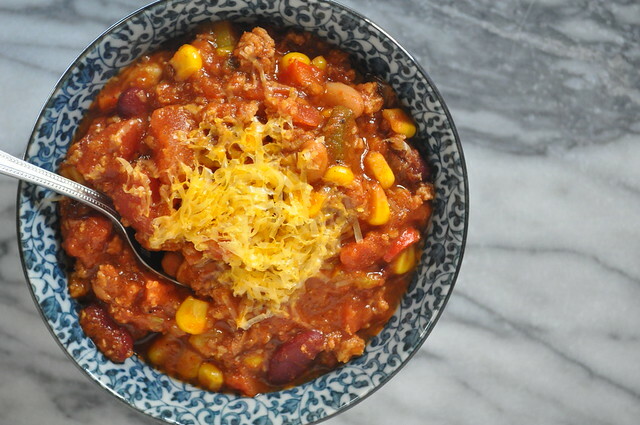 Serve with freshly chopped onions, sour cream, and cheese. Enjoy! * Technically, it can be served once the meat is cooked, but we highly recommend letting it cook and all the flavors meld together. Trust us. Like our recipes? Don’t forget to like, follow, subscribe, and share! It’s our one year anniversary! A year ago today we posted our very first recipe! How crazy is that? 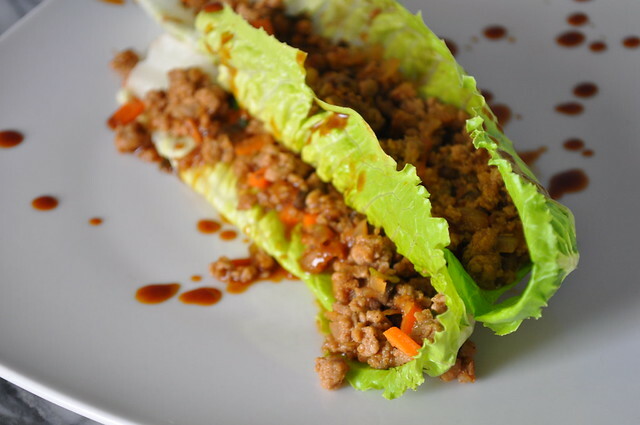 Today we are sharing one of our favorite healthy and tasty recipes, Lettuce Boats! 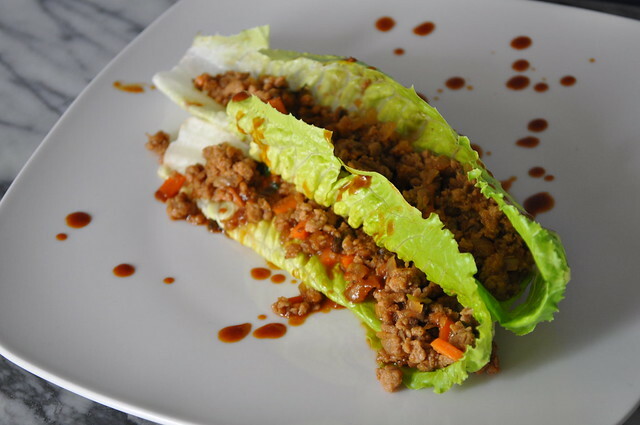 If you really hate lettuce, you can always substitute the lettuce for tortillas or whatever, but at least try this healthy alternative! As we like to say they are bomb diggity. 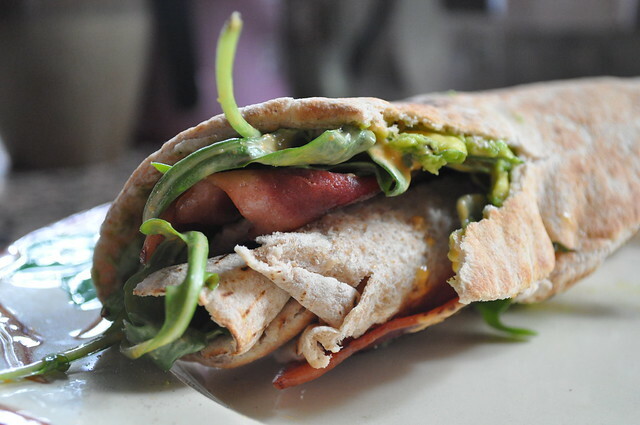 Healthy, filling, and delicious! Packed full of protein, texture, crunch and they’re totally guilt free. 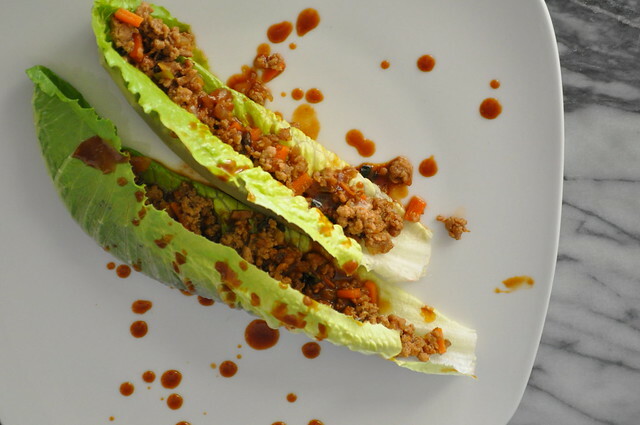 Celebrate our one year anniversary with us by eating well and making these mouth watering lettuce boats! Heat oil in a large pan over medium heat. 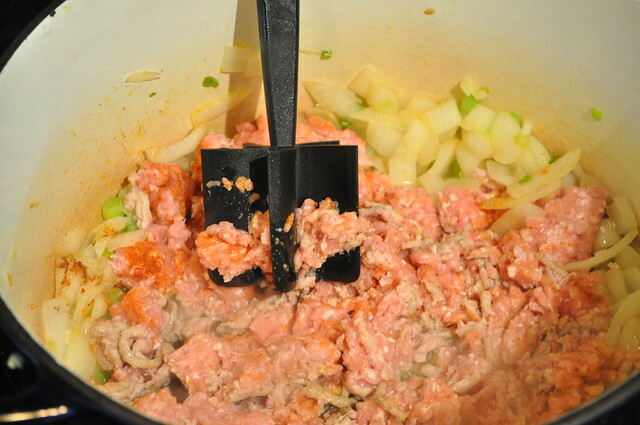 Start browning the ground meat and add a few dashes of soy sauce for seasoning. Once the meat is half way, add the garlic, chopped onions, and carrots. Incorporated it well. 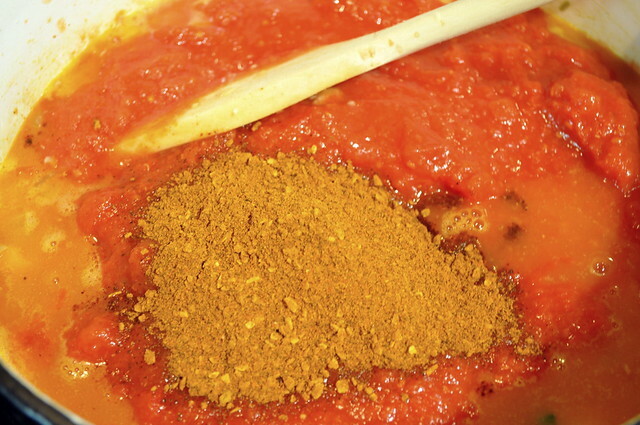 Grate ginger into the pan, also add: soy sauce, rice wine vinegar, sesame oil, and sriracha. 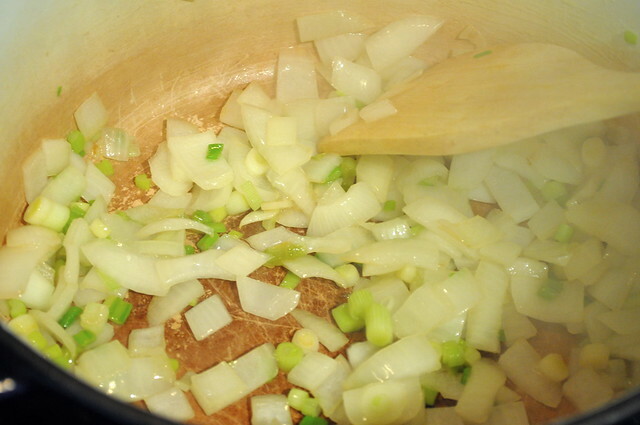 In a small saucepan, heat some more oil to sauté the mushrooms and green onions. Season with salt and pepper. After you sauté the mushrooms and green onions, add them to the pan with the meat and give everything a good mix. Taste and adjust any seasonings from here. 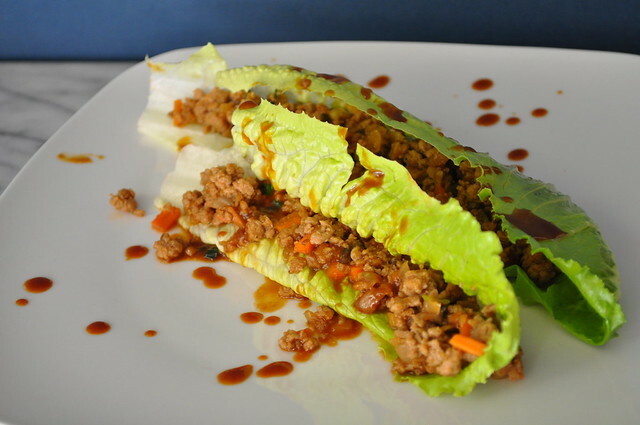 Sauce: soy sauce, hoisin, sesame oil, and a mustard of your liking. We chose Coleman’s English mustard because its one of our favorites, but you can also choose dijon, spicy or even just regular yellow mustard. 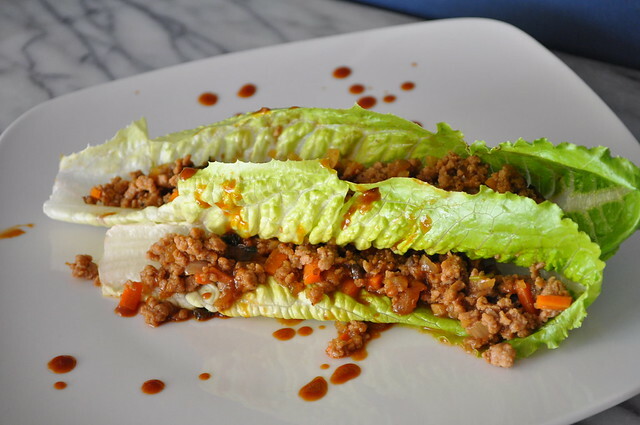 Serve with lettuce as a vehicle for the meat to your mouth! Adapted from Bobbi’s Kozy Kitchen. A couple of months ago we gave you our Bacon Arugula Avocado Sandwich on Sourdough, but we wanted to give you a healthier version of one of our favorites. 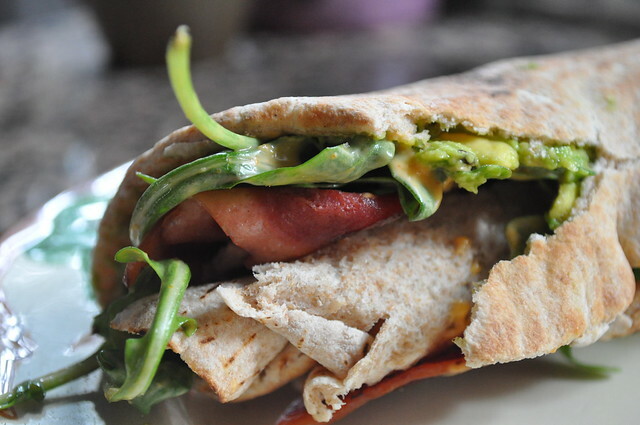 For this recipe, we replaced the thick cut bacon with turkey bacon, and switched out the sourdough for a whole wheat tortilla or pita. 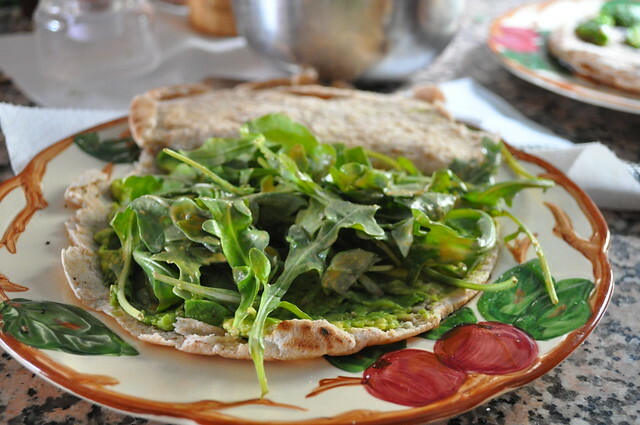 This is a really simple lunch and super healthy and satisfying. If you like our recipes, don’t forget to give us a follow so you don’t miss out on anymore tasty treats! Cook your turkey bacon to your liking (microwave or stovetop) and set aside. Pro tip: Turkey bacon tastes WAAAAY better if you cook it in a skillet. Trust us. In a small bowl mix together your arugula and Sriracha. 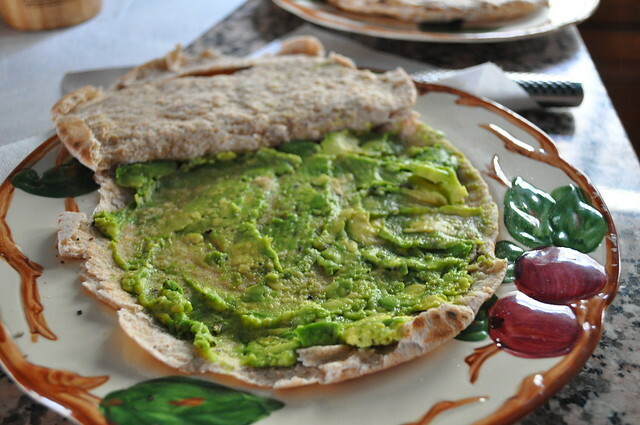 Place the avocado on the tortilla and lightly mash it up and spread around the tortilla. Sprinkle the avocado with kosher salt and a little pepper. 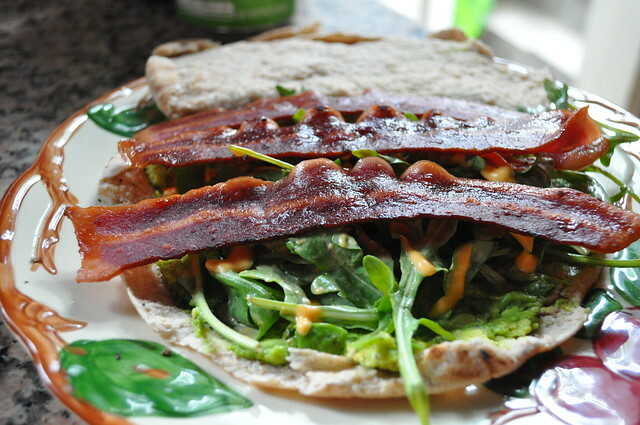 On top of the avocado add the arugula and then lay the bacon on top. Roll up and enjoy!